What Exterior Features Are In The New Jeep Compass? A compact SUV allows drivers to experience the best of both worlds. They are able to have the performance features of an SUV while still being small enough to easily maneuver. But what about all of the great exterior features in these vehicles? 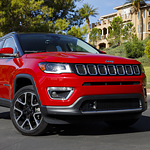 That is why our team of compact SUV experts at Ramey Chrysler Dodge Jeep RAM FIAT located in Princeton are so happy to tell you all about the impressive exterior of the all new Jeep Compass! First, the rear tail lights of this car include alluring LED lighting which give this SUV a unique glow in the night. Plus, these lights will last far longer that older styles of tail lights. Finally, drivers have more than a half dozen different wheel designs to choose from. This allows drivers to make the exterior of their new car as unique as they are by selecting the wheels that best match their individual style.